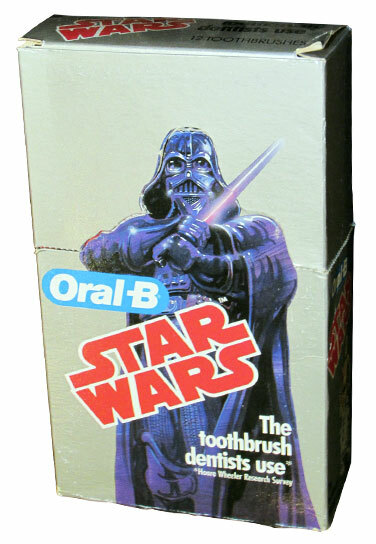 Quite possibly the most interesting and diverse area of the Oral-B collectibles are the various store displays. The displays cover a wide range of material from floor dumps and poster offers to the highly artistic display headers and the mundane 2-color counter top designs. There are even unique items used in the United Kingdom and Australia. This page will be updated as more discoveries are made. Probably the most recognizable of all the Oral-B store displays is the Floor Dump. 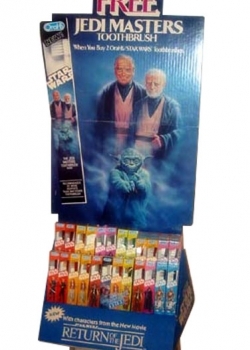 This was the main retail point-of-purchase display and was used for all promotions going forward. 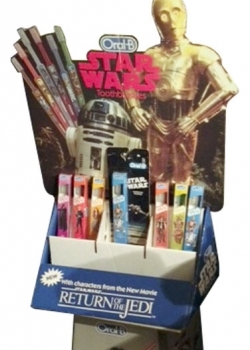 The Floor Dump is completely made of cardboard and consists of a base, divider tray and a header card (in some instances, the divider tray and header were separated from the base, and used as a counter top display). 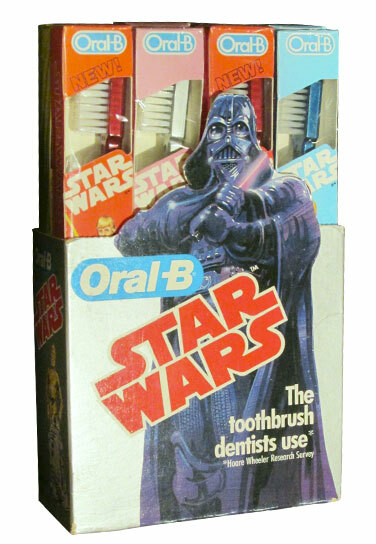 The graphics on the base were the same artwork that was featured on the toothbrush packaging with Darth Vader taking center stage. 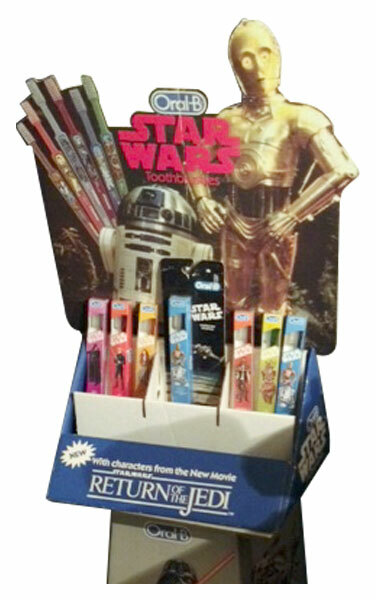 In total the display stands around 4 feet tall, with the toothbrushes being right at eye level for the kids this product line was being marketed to. There are three header cards that were used in conjunction with the Floor Dump. 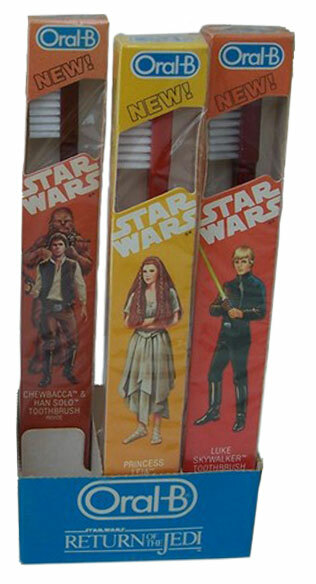 The first features the six toothbrushes in the line, as well as an image of C-3PO and R2-D2 from Return of the Jedi. 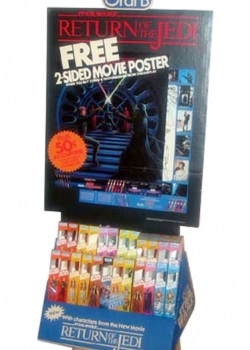 The second header was used to advertise the free poster offer, which also included a separate cardboard sleeve that held the posters and attached to the Floor Dump. 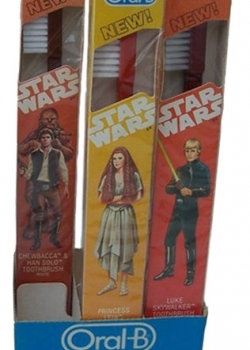 The third and final header not only features some of the best artwork in all of the vintage Star Wars display material, but is also one of the most difficult to track down – the Free Jedi Masters Toothbrush header. 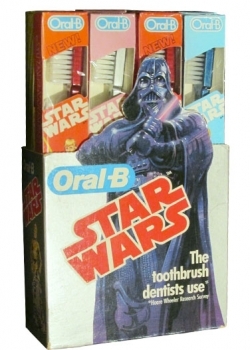 The airbrushed art of the three Jedi Masters is unique to Oral-B and is one of the few times the Jedi Spirits were featured in any advertising material.It’s easy to see why Oral-B used this display as its main retail display. It’s not only incredibly versatile, but the graphics are visually appealing and eye catching. 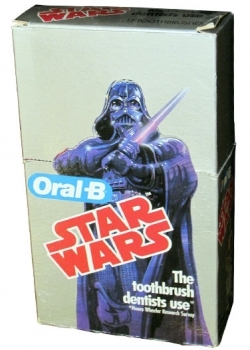 No toothbrush collection is complete without one. 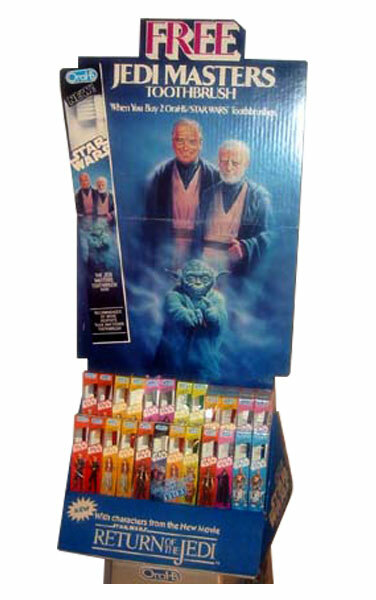 There are two known styles of this type of “Pre-Pack” display, and they were both used internationally. 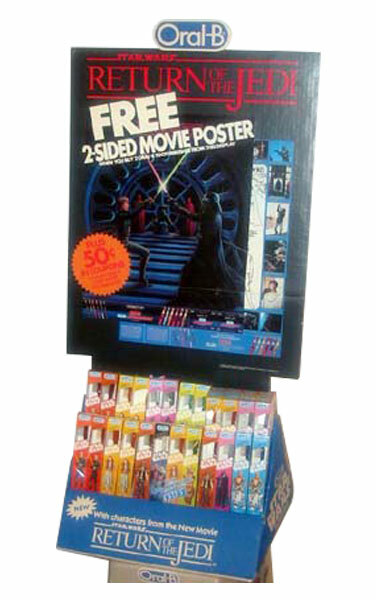 These types of displays were shipped to retail stores with the toothbrushes contained inside. The retail stores could then tear off the perforated top portion of the display and put them out on store shelves. Australia – The first and most recognizable of the pre-pack displays is the Australian counter top display. Simple in its design, but the imagery is incredible. The large cut out of Darth Vader is the first thing you notice, followed up with the brilliant red Star Wars logo. 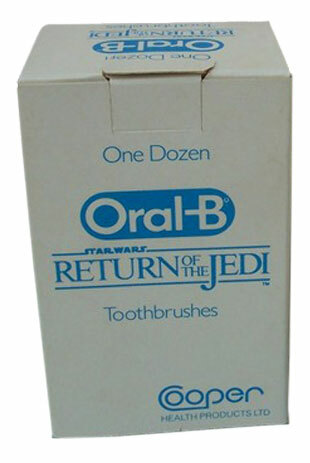 I love the way Oral-B used the Star Wars logo throughout their line and this is no exception. There are two variations of this display which seem to be mostly copyright text formatting. United Kingdom – Little is known about this particular display, but that doesn’t make any less intriguing. 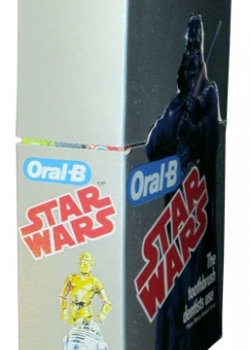 The overall design of the display is pretty bland by comparison to all the other Oral-B products. However, what makes this particular display stand out is the Cooper Health Products logo. 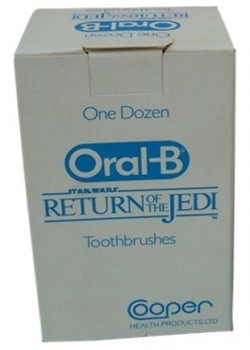 Cooper Health Products is the parent company of Oral-B. And it’s really interesting to see their logo so prominently displayed along side the Oral-B logo when it’s always been understated elsewhere throughout the line.